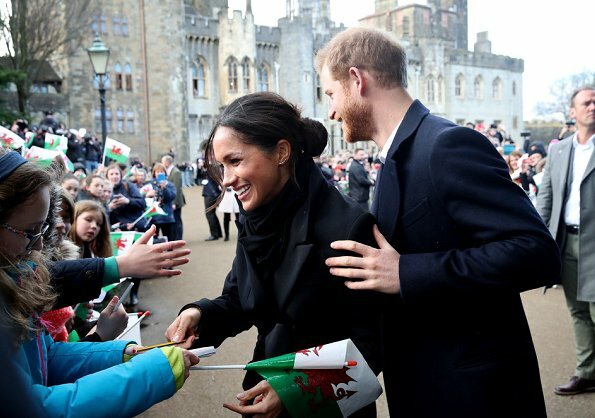 On January 18, 2018, Prince Harry and fiancee Meghan Markle visited Cardiff Castle, in south Wales, for a day showcasing the rich culture and heritage of Wales. After meeting members of the public, they joined a festival celebrating of Welsh culture inside the castle. 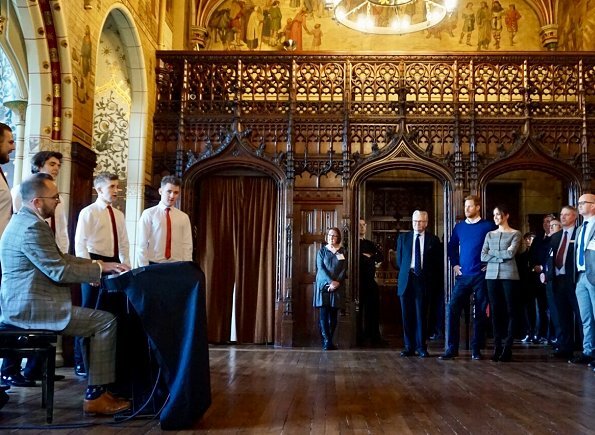 Prince Harry and his fiancee Meghan Markle watched a performace during their visit to Cardiff Castle. 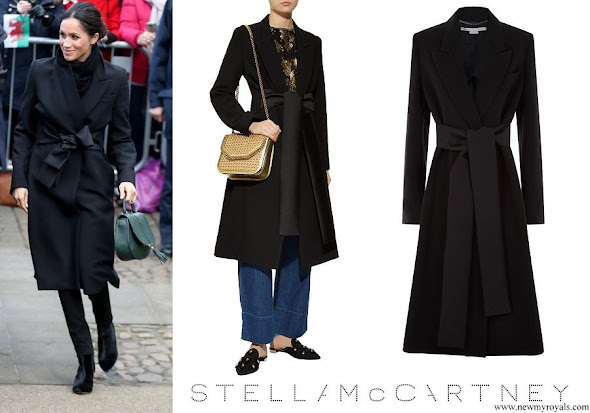 (Meghan has wore black coat by Stella McCartney and a wool jacket by Theory. 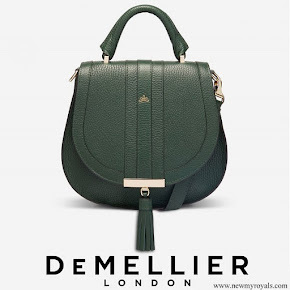 In addition, she has wore black suede and leather boots by Tabitha Simmons and she has carried a shoulder bag by Demellier London). I love the coat, pants and boots - the jacket is ok, but I would've preferred a colour. I'm also happy that she took her coat of when indoors and although the hair might be on the messy side I rather like it - fits the look. So agree. The happiness transformation in Harry's face is wonderful to see. He has such a clear and connected expression now, like he's embraced his place on this earth. Love, LOVE this coat! Great cut for Meghan and the large satin bow belt is so charming. I want one! It's great to see them looking so happy but still waiting for an outfit with some COLOUR! Hairwise, perhaps Meghan is the new Maxima! 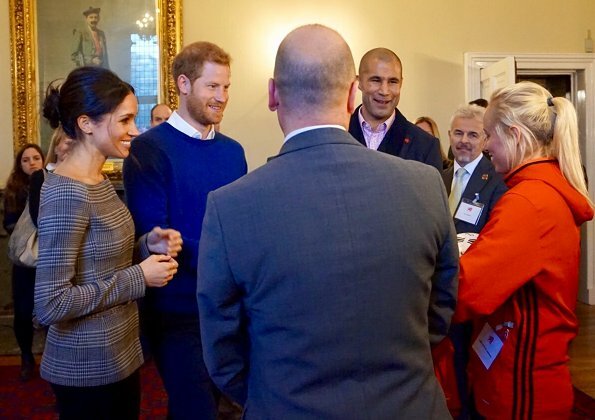 Harry , in the sweater and shirt combo when almost all the other males appear to be in shirts and ties looks sadly underdressed. 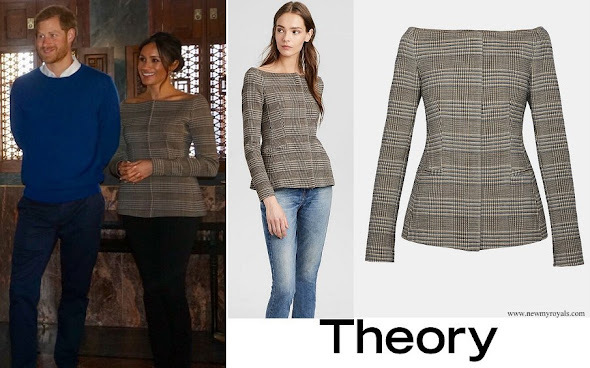 The colors Meghan wears are typical winter colors for professional women in the larger Northeastern cities in North America, such as Toronto, New York, Boston, Philadelphia, etc. I realize that she is in Britain now but her conservative professional wear may change only slowly, if at all. It's possible that summer may bring different choices. Agree with AnnieM about Maxima connection. Meghan's personality reminds me most of Maxima of all the royal ladies. Maybe her hair is a reflection of that! Annie M - re another Maxima, you took the words right out of my mouth. Sloppy. I love the way she looks. It's a great outfit - casual but elegant! And she is doing a great job of interacting with people. If Catherine had worn a neckline like that to an official daytime event involving meeting children, she would be soundly criticized. Messy hair again for Markle. That must be Markle's look. Wonder if she will have messy hair at her wedding ceremony. They want to be unconventional, so maybe so. Also the crossed arms is strange posture at an "official" event. But hey, she can do no wrong can she. Of course she can do wrong, as alla of us!! Incl the Catherine. But I think Meghan M coming with something new i in this Royal Family which is very stiff. I agree as for the messy hair! This couple is just more casual than the other royals and we’ll get used to it. I do prefer the crossed arms to the crotch clutch. Crossing her arms across her chest is neither modern nor casual, it is rude. And as far as body language, it shouts how uncomfortable she is. For starters she is not crossing her arms across her chest, the arms are intertwined below her bust in a relaxed manner. I have never heard of this posture being "rude" unless your are pouting and kicking your feet at the same time. 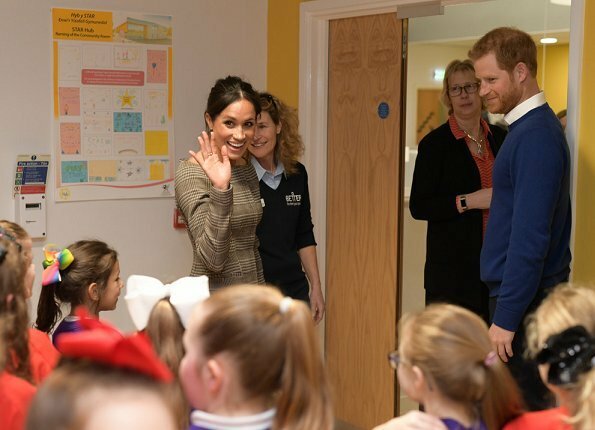 There are multiple other shots on which she looks happy and engaged, for God sake give the poor woman a chance before throwing her to the wolves. Oh no, she crossed her arms! The pearl clutching over that is hilarious. Granted I'm not a fan of her nor Catherine, but seriously that's the biggest problem that she crossed her arms for, who knows how long exactly? And just happened to be the photo used? There are pics of HRH Queen Elizabeth crossing her arms, someone needs to tell her that she's rude! Crotch clutch ROFL and totally agree, I hate it when Kate stands like that, it draws attention to her bust and crotch! And what is a "normal" person? Is Catherine an "abnormal" person? Or, heaven forbid, "subnormal". Am I more normal than you? In this day and age a "normal" woman at, let's say around 23 years old, is pursuing her own career, earns her own money, supports herself with the money she earns, pays herself for her home and her clothes and knows full well the value of her efforts and the price of the the things she buys. That's what Meghan has done. Catherine has never had her own career and never has spent a Pound earned with her work. That's the big difference between both ladies. Sorry, but, gosh, I must have been abnormal going to graduate school, paying my own way working a part time job until 25. I agree, "normal" is not the correct word for starting such a discussion. She started her own career after graduating at St Andrews. She had a job. And as a girlfriend of a Prince, finding a job was difficult. And I would say, that the Duchess of Cambridge still has a job (duties, no free decisions). Meghan cannot "do better" than Catherine. They have different roles. And different personalities. Comparing them makes no sense. Prince Harry looked quite handsome although he was dressed casual. 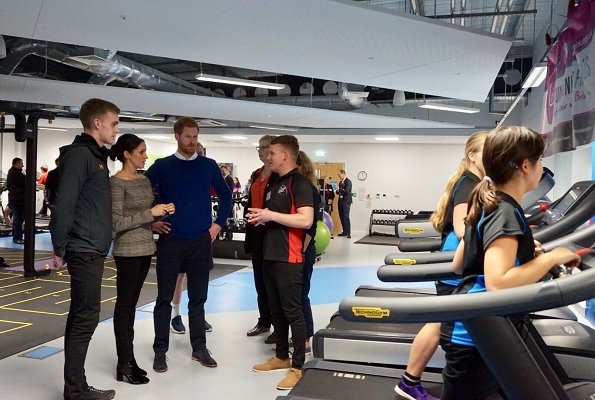 His fiance Meghan Markle did not overshadowed him in anyway. She didn´t overshadowed anyone. These two are not bored, they find interest in a lot of things. She is abroad and holds her life in her hands all alone. Someday she and he will look back and see all the progress they have made. Sans vouloir critiquer Kate (qui fait très bien son boulot...), Meghan est tellement plus moderne, tellement plus fraîche, tellement mieux vêtue, tellement plus spontanée ! Cette fille est une vraie bouffée d'air frais ! Bien joué, Harry ! Et Harry semble tellement bien et mieux dans sa peau. Ils sont tellement normaux. 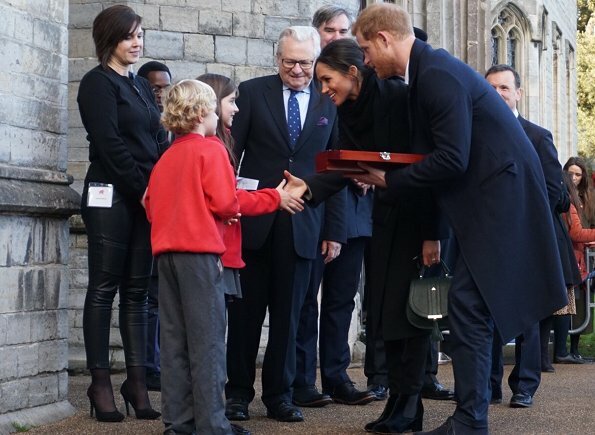 Sans vouloir critiquer Kate (qui fait très bien son boulot...), Meghan est tellement plus moderne, fraîche et spontanée ! Et tellement mieux vêtue que sa future belle-sœur, trop "old school"... Bien joué, Harry ! I liked her outfit, and I do know she likes neutrals, but I hope soon she starts wearing some color. Otherwise, her wardrobe could become boring. Cute outfit, bad hair.. hope this does not shape to be her go to look. What's about the hair (and hairdo) of Michelle Obama? Always stunning. 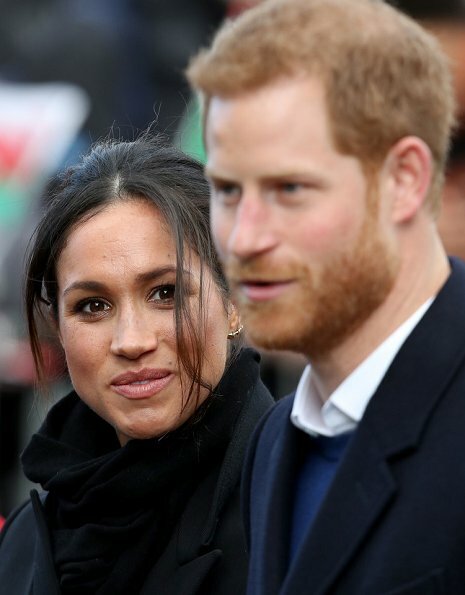 Meghan's hair is not any more difficult than others - or is this a sideblow to her race? Meghan sports - like Harry - a modern, casual, urban style. This is perfect for their role and that's why they look so good together. 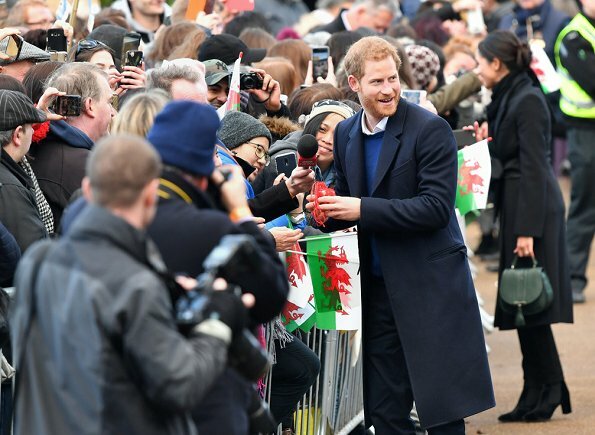 Up to now we saw Meghan in rather informal events, often outdoors with wind and rain. I am sure, when it comes to gala events she will have her hair perfectly styled. I think the casual updo suits her very well, look at Photo no 7. All she has to do is take care, that the side strands don't fall that much into her face. She has to keep that in mind, as she is moving a lot in these events, meeting and greeting people, bowing down to children etc. She will learn this. She is doing great up to now. And for those who compare her to Maxima's hair. Meghans hairstyle may have been too casual in moments, but Maxima's hair looks destroyed and unpolished unless she has he hair done with lots of extensions for formal events. This ist not the same. I'm with you, Beth, about Meghan's casual hairstyle. It's more modern to not have every hair ruthlessly dragged into place or artfully waved. She has looked entirely appropriate for the events she has attended. Beth, I completly agree with You. I totally agree with you, Beth. Beth, I do not understand what you mean. Why is a comment on her hair a "sideblow to her race"? And what race? As far as I know Meghan is neither black nor white, she is "in-between" or however you want to call that. Coralie, I live in mixed national/mixed racial/ mixed color....whatever one wants to call it marriage. In our international family you will find about ten nationalities and colours of all shades and hairstuctures of all kinds also as sizes of all kinds and so on. I don't even notice these things anymore, as I do not notice it on Meghan. All what I see is a beautiful, warm-hearted, intelligent woman, who has clear visions and goals in her life and is up to serve people. But we heard it more than once that the curly hair of our kids have been told ..."difficult". Why??? They are not. They are beautiful. They are just difficult when the european/caucasian straight hairtype is regarded as "normal hair". This is why black/mixed/wahtever you want to call it women in public position, like Michelle Obama, like Ophra Winfrey, like the Obama daughters usually straighten their hair, they want to keep it out of discussion. Remember the very rude comments that Michelle Obama had to bear? It is totally up to Meghan what hairstyle she wants to wear. She can straighten them if she wants, like some people curl up their hair or colour it. I wish she will have the courage to one day wear them open and curly. I can already hear the shitstorm!! But what a role model she would be for any coloured/black girl in this world! Beth, yes and yes to your comment. Chapeau!!! Coralie, that "in-between" comment is so indelicate, to put it mildly. Totally agree with you Beth! Every single word! Spot on! Hit the nail on the head! You called it! Cherry Blossom, what is "so indelicate" about my comment? That woman has a black mother and a white father. How do you call these people? Are there "right" and "wrong" expressions? English is not my mother tongue, so could you please explain? Discrimination starts already when people feel the need to comment on the skincolour or hairstructure or facial features of somebody and refer to their origin/heritage. I will give an example: my son, who has a German mother (me ;-)) and a Congolese father, plays football(Soccer). When I stand in the crowd to watch him play I often here comments like this: "Wow, did you see that great action of the black guy".....the black guy?? I never hear comments like: the white guy on the left made the goal. The 'white guy' is considered as the norm and is called by his name or his backnumber. And that is what my son reclaims, he wants to be called by his name and not by his colour. I agree with you there are no 'right' words for people of colour. So why don't we just stop searching for 'names' for people and call them simply by their names. Ms Meghan Markle. Point! 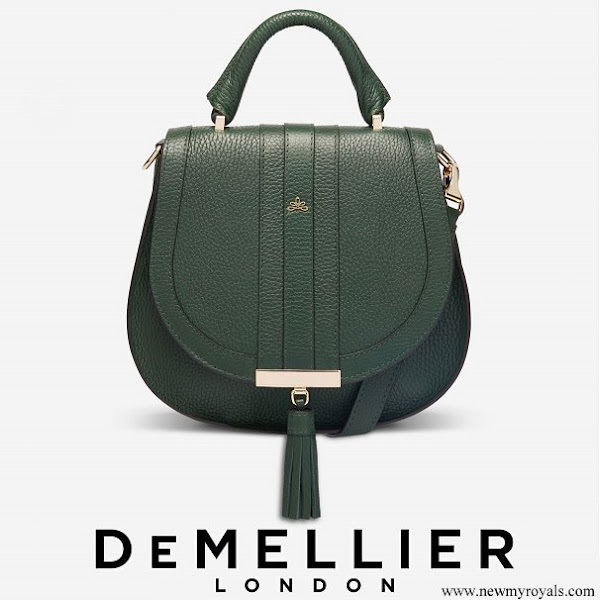 I am looking forward to see more pictures of Meghan, I like her style and hope we are discussing in future simply that, her fashion and style. There is abolutely no need to reflect on her hair being 'difficult'or her mother coming from the Caribbean or whatsoever. They make a really lovely couple. I like her coat but I almost always like Stella McCartney's design. These two are so happy and relaxed together and Meghan don't mind if her clothes get wrinkled with the children. Her messy hair is perfect in this stuation. 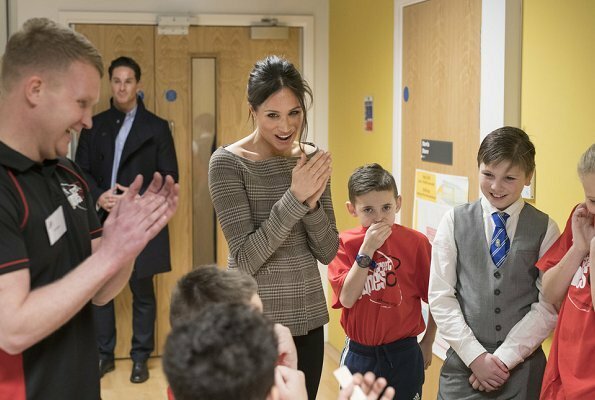 Her outfit looks good, and although she is not in the same position as the Duchess of Cambridge, she needs guidance on her hairstyle for official engagements. Which I am sure she will. She is a very elegant and fashionable woman. Google her at events that were black tie. She is very sophisticated. The trips she and Harry are doing now are not formal visits. They are the kind of places where she can go knee deep meeting the masses. Radio stations..kid events..sporting events ...places that interest them as patronages. She is not unveiling plaques or cutting ribbons or stepping in for the Queen. She has been completely appropriate for these trips. A messy bun is quite hip and chic btw. I am 100% sure that when the time comes where are going to more formal events or travelling the Commonwealth for Her Majesty she will be polished! Catherine has been from day 1 groomed to be Queen. She cannot have anything out of place. My God that must be claustrophobic at times. I suspect she might wish she could relax her style a bit as she was more of a relaxed dresser before she married. what messy hair???? meghan rocks period!!!!!!!!!!!! This messy bun look actually looks good, if she were at a sunday brunch or casual dinner with friends. But out on a public appearance? No - she needs to work on that hair! She is quite a natural, and seems to be rising to the occasions. The couple are causing a nice stir in UK! Wishing them well.